Goal #1 - Run a race in every state (preferably a half marathon), Goal #2 – BQ, Goal #3 – Running Coach Certification, Goal #4 – Start a running program in local elementary schools. For my sanity…it really does burn off the crazy! Marathon #3 was my 3rd in 352 days in celebration of my 50th birthday. I was going for a 4 hour BQ and was on target to finish with a sub four hour time when right before mile 21 my quad locked up on me. I hobbled along for the next few miles until I worked it out and felt I could run, of course at a much slower pace, and with BQ aspirations shot I was mentally defeated. Around mile 24 I came across a woman I could see ahead of me who was stopping, then starting over and over again. When I caught up to her and started passing her she started to stop again. I told her not to stop, that we were going to finish this race together. For the next two miles, I talked to her, now I don’t even remember what I said. All I know is I just kept telling her to keep moving, we were almost there. When we crossed the finish line I cried from total defeat until that woman came over and thanked me. She said until I came along, she was ready to quit. She told me without my help she would not have finished. It was the most rewarding feeling knowing that in the midst of my failure, I was able to help someone else achieve their goal. It was her first marathon. I love helping others achieve their running goals. I’ll talk your ear off and make the miles slip by without you even noticing them or at least that’s what I’ve been told! We will have a lot of fun along the way! 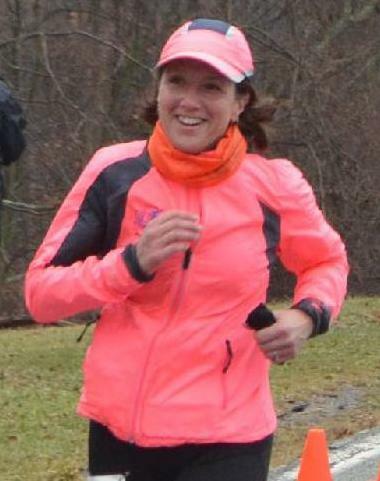 I started running 4 years ago at the age of 48. I’m a mother of 4, ranging in ages from 31 to 12 and have been married to my high school sweetheart for 32 years. I’m a self taught runner and until I was given the opportunity to mentor a Couch to 5K program a year and a half ago, I had never run with anyone outside a race. Through running, I have found my passion and my calling and a family of running friends who I would have never known otherwise. With children I’ve done many things in the past, but right now I focus on helping the runners who I’ve mentored through a Couch to 5K program to keep running by scheduling weekly runs together, sharing information on running, cross training and races through a Facebook page called Running Friends.